In my article “The Benefits of a Paint Coating”, I discussed several advantages of popular paint coating products. One of the key benefits highlighted in that article is the noticeable difference in ease of maintenance. Many people have the incorrect impression that paint coatings are a “no maintenance required” type of product. This is simply not true. Proper maintenance is still required to take full advantage of your coating. Basic routine maintenance will help to keep your coating looking and performing its best and will help you get the maximum life out of your coating. Routine washing is crucial. I recommend my customers maintain a wash routine that consists of a proper hand wash at least every two weeks. As your coating becomes covered with dirt and contamination, you will notice a decrease in hydrophobic properties (i.e. beading & sheeting). It is important to remove these surface contaminates often. Using a specially formulated shampoo like the CarPro Reset will help to effectively clean your coating and it rinses away easily without leaving behind gloss enhancers or other surfactants. This is an ideal coating maintenance shampoo, however there are other options that will be just fine as well. You will notice that your vehicle will be very easy to wash because the dirt will wipe away easily from the coating, and your wash mitt will slide effortlessly across the surface. Likewise, drying is also much easier because the majority of the water can be easily sheeted from the surface. I recommend using the Master Blaster to quickly blow the remaining water from the surface. 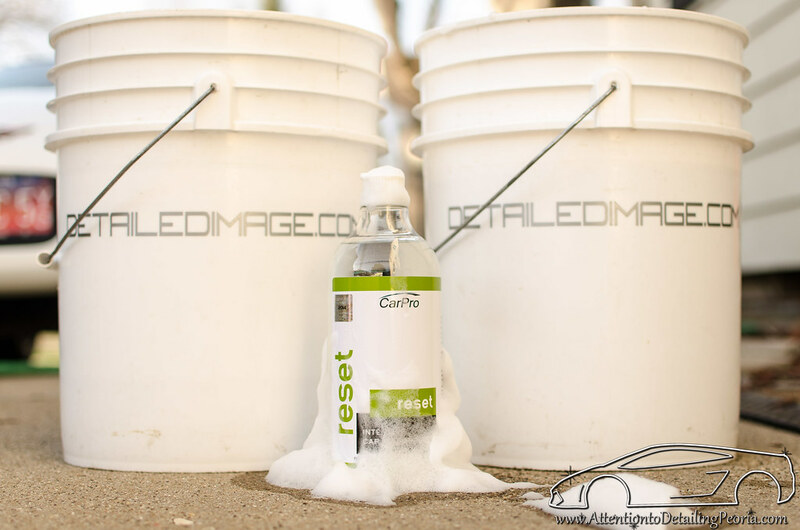 Photo: CarPro Reset – ready for the two bucket wash method! Water spots are always a potential hazard. Hard water spots are a common occurrence if water is allowed to dry on the vehicle’s surface and is not washed shortly afterwards. Sometimes the mineral deposits can become so tough that even a thorough washing will not remove them. 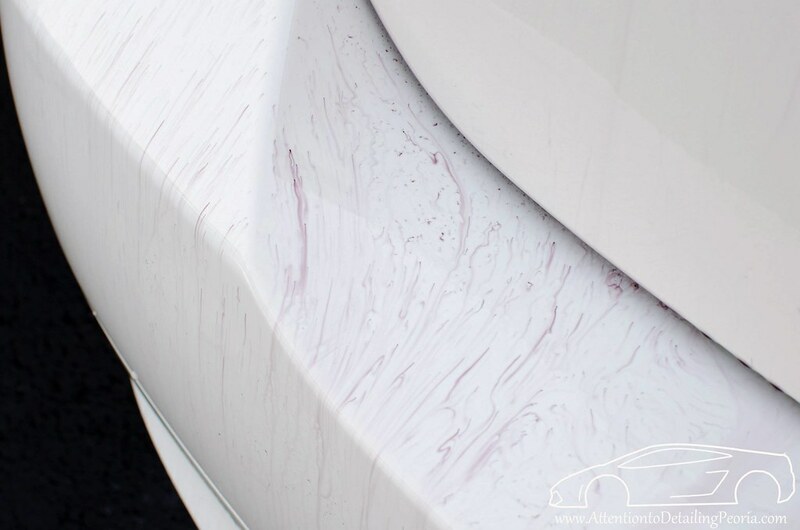 These water spots are often removed with a light polishing process, however this is not a good remedy for a coated vehicle because you may risk removing the paint coating. Luckily CarPro created Spotless Water Spot & Mineral Remover for this exact situation. This product quickly and easily eliminates hard water spots from your vehicle without the potential risk of harming your coating. Coatings resist bonded contamination better than most traditional forms of protection, however they will still become contaminated over time. Luckily, this contamination is typically easy to remove with a product like CarPro’s TarX and IronX. In most cases these products will remove the majority of bonded contaminates from the surface of your coating, but it is possible that your vehicle may also require light claying to remove other contaminates. I typically recommend a quick decontamination at least once each year. Photo: CarPro IronX reacting with bonded iron contaminates and safely dissolving them. Many people are interested in applying additional protection on top of the coating. It is important to remember that when you are topping your coating with another product, you are covering or masking some of the properties of the coating. For example, if you apply a wax on top of your coating, you will be observing the properties of the wax until it wears off and the coating is exposed. If you choose to top your coating, you will still have a great base layer of protection beneath your “topper” since the coating will still be present, but the beading, sheeting, dirt/dust attraction, and other properties that you observe will be characteristic of whatever product you have used to top the coating. While a typical spray wax may work fine, there are other products that tend to perform much better on top of paint coatings. My personal favorites are CarPro HydrO2 and CarPro Reload. These two products are silica based, just like CQuartz and 22ple coatings, therefore they are excellent “coating toppers” because their properties are very similar to the coating that is beneath them. When used on top of your coating, HydrO2 and Reload will provide additional protection, slickness, amazing hydrophobic properties, and best of all – they are extremely quick and easy to use! If you decide to top your coating, these products can be used as often as you’d like, but I typically suggest using one or the other every 2-4 months. If you follow these basic steps for coating maintenance, you will be certain to achieve excellent durability and performance from your paint coating! After you wash the car with reset and dry it. After the car is dry and realized you have some water spots. What product you recommend and have tried to remove the water spot (like quick detail) on coating ?? Carpro makes a product called Spotless. It is absolutely stunning for removing water spots. For small water spots that occur immediately after washing, you can simply use a CarPro Reload to wipe them away… or if you don’t prefer to add anything on top of your coating, CarPro Eraser can even be used for wiping away those spots. If the spots have set for a while, you may need to utilize CarPro Spotless to remove stubborn spots as I mentioned in the article. Excellent article Zach. Quality content right here. Thanks Zach What could i use with Opti-coat 2.0? Opti-coat 2.0 dose not have the water beading of some of the other paint coatings. I love using CarPro Reload on top of Opti-Coat. Opti-Coat is lacking in terms of surface slickness, as it is naturally a bit ‘tacky’ feeling which I do not prefer. Reload leaves an awesomely slick surface that is incredibly hydrophobic. It works great on coatings or on bare paint! Opti coat or opti gloss, good idea to top it with Reload for slickness and added protection? Sure, no problem there… you can also use Optimum Opti-Seal if you prefer to stay within the same product family, but I prefer Reload or 22ple VS1. Thanks Rasky… that is my plan as well. I always tell people how to do it, but this will give me something to send customers for reference as they need it. From everything I have read and worked with the use of Iron-X, Tar-X or any high alkaline chemicals (term used on most manufacturer’s warnings) will remove most coatings. The only exception that I know of is Opti-Coat. You can still lightly clay the car to remove rail dust. While it is true that IronX and TarX may degrade or completely remove traditional protection (ie sealant or wax), they will be fine for maintaining your paint coating. “Question: Will Iron X remove wax from car paint? From what I’ve found Carpro does not recommend using IronX but instead recommend using “IronX Soap” which is much, much more diluted. Have you had success using either IronX or TarX on a car with-out damage to the coating? Clay, I have never used any GTechniq coating, so I cannot speak for them… but I have CarPro coatings on my own vehicles and use Iron X to maintain them with no issues. IronX is a pH balanced product (~pH 6-7), and is actually recommended for general maintenance on their coatings as I referenced in my previous reply. TarX is not pH neutral and should only be used as needed if road tar is a problem. I just confirmed with a CarPro rep, and it can interfere with hydrophobic properties if “used excessively”. If TarX is needed, it is recommended to spray the product on a towel, and wipe the effected area with the dampened towel, then immediately rinse the area. Clay, thanks again for the comments. As I have already explained… IronX is not an alkaline. IronX is pH balanced (pH between 6-7… similar rating as pure water) per CarPro’s description. The warnings on the CarPro site are for products with a pH higher than 11. Again, as I have already stated, CarPro does indicate that TarX may interfere with the hydrphobic properties of their coatings if it is used excessively, therefore this product should only be used on an as needed basis, and in the manner that I described above. As far as other coating manufacturers, it is best to follow their recommendations for maintenance, but even the GTechniq site that you have copied does not specifically call out IronX as being harmful. The answer to the question involving IronX specifically states that ‘high alkaline products’ are the real threat, which would not include IronX as it is not an alkaline, or basic, product. Again, thank you for the information… If you have any other concerns related to IronX or TarX, I would encourage you to contact CarPro directly. Clay, I’ve used Iron-X on Exo V2, and a car that had C1/Exo V2. I did it maybe 3 times over the coarse of 12 months or so depending on how much the car sat out, or was driven. I only used Gtechniq Gwash, and when I used Iron X, it was totally fine, in fact it seemed like the beading was maybe a little better after. I remember reading somewhere it helps open the pores of the coating up(I assume because it removed the contamination). I’ve also used it on 22PLE VX1 Pro, and on 22PLE Rim after Ohio winter…no degradation to the coating. I would assume if you use something like a tar remover, or “purple degreaser”, then yes, it will impact the coating. I’m not a pro, just a DIY guy, and after reading all kinds of reviews and websites, I’ve not had any problem with Iron-X effecting a coating. How would you recommend removing bugs from the paint coating? Would you still use a light abrasive pad with a specific bug/tar remover? I tried the tar-x with my wash mitt, it removed some of the bugs but not the guts as they were still splatters on the coating after drying. Hi James – but remnants should wipe away easily if they are not left to sit. I typically soak a towel with a rinseless or waterless wash solution and then wipe the front end of my vehicle immediately to avoid bugs from settling into the paint. If you notice what appears to be bug guts still on the paint after a thorough wash you are likely seeing remains that have etched into the paint. Bug splatter is acidic and can cause a fair amount of damage when left to sit, especially in warmer weather. If you have etched marks, you will need to correct these areas with a machine and polish or compound (sometimes even wet sanding). Then with the etched marks, since I have a coating installed the etching should be contained within the coating or will it eat right through the coating and etch the paint? Also with the etch marks, when I go an polish the areas with etching how essential is it to remove all the previous coating if I am planning on re-coating the area with the same exact coating, 22ple HPC, and are there any signs other than water beading/sheeting if I have removed all previous coating? The coating will contain the etching until the coating is penetrated, then the paint is at risk… as far as I know there is no real way to determine when this transition has taken place without laboratory testing, however the chemical makeup of coatings make them much more resistant to environmental contaminants like water spotting or bird bombs compared to traditional waxes or sealants so your odds are better with a coated car than an uncoated car. It is not necessary to ensure you have removed all of the previous layer of coating. There is no risk of applying a new layer directly on top of your existing layer as long as the surface is clean. Again, since the coating is so thin (a couple microns at best) there is no way to ensure it has been removed. Even water beading is a completely false test as bare paint will bead water when it is clean. Sorry to bring this back from the dead, so to speak, but I’m seeing signs that my initial application of CQUK may have served all it can. I’m planning on claying and some light polishing before laying down a fresh coating, my question is regarding the new application. I’m again using CQUK, after clay bar, polish, and Eraser, is there anything I need to do or use before applying my new coating? I guess logically I’m expecting any leave-behind from the initial coating to prevent the new application from bonding correctly. Thanks for the help! Hi Nic – don’t over complicate the process for yourself. If you need to reapply your coating, you can do so very easily. The coating layers can build upon each other as long as the surface is completely clean and decontaminated before the new coating is applied. There is no way to see if you have removed the existing layer, so don’t stress about that. Wash, decontaminate, and correct the vehicle as needed. If no correction is needed, simply perform a light polishing process to clean up the surface and ensure the clarity is at optimal levels. Wipe the vehicle with Eraser or IPA to remove any residual oils, and then reapply the coating. Excellent information and very useful to a guy who just had his first coating experience. Particularly helpful to see what kind of topcoat I might be able to use over my coated vehicle. 1) Should I not use nano skin (or clay) in the near future…or perhaps ever on this coating? 2) Any special suggestions for cleaning the glass….can I use the Stoner product I have used in the past? Anything better and more appropriate for over the Ceramic-Pro? 3) Is Chemical Guys Honeydew Snow Foam OK for washing? 1 – I personally do not recommend using nano skin or other synthetic clay substitutes on a vehicle unless you plan on polishing them afterwards (which could jeopardize your coating). I have found that synthetic clay substitutes have a significantly higher chance of marring your paint, so while they are extremely efficient and effective at removing bonded contaminates, they may not be a suitable choice for maintenance on a perfectly refined finish. If needed, we recommend using a fine grade clay bar and ample lubrication to spot clay the vehicle, though in my own testing I have found nano coated vehicles will resist bonded contaminants quite well. I would start with a chemical iron remover, such as Iron X, to eliminate any ferrous contaminants and then determine if claying is needed afterwards. 2 – Any glass cleaner will suffice. Stoner Invisible Glass is a fine choice. 3 – Yes, use as directed and pay attention to the dilution ratios. This goes for any shampoo. Thanks so much Zach. As a follow up, what is safe to use as a quick detailer over the Ceramic Pro? Also, would Reload be just as effective with my front end covered in a PPF (clear bra)? The Ceramic Pro is on top of the PPF. If not, is there another more effective product/sealant than Reload? I have not come across a quick detailer that would cause any issues on top of a coated vehicle. My personal favorite QD’s are Meguiar’s D156 and CarPro EcH2O. Reload will work well on top of PPF. There are several products that are very similar to Reload… check out 22ple VS1, GTechniq C2 V3, and Gyeon Cure. Hi Zach, it’s been about 2 months since I applied ceramic coat onto my car. At the first result was awesome. But I’m seeing some deterioration of the effects of the coat. Water is not beading like it was, like a month ago. It still repels but just acting like I have a sealant that’s wearing off soon. Can it be my ceramic coat is wearing off so soon? Any help or suggestion is appreciated. Thank you. Hi Jerry – to simplify this topic greatly, water beading does not indicate protection despite what most people tend to believe. Water beading is simply a product of high surface tension. Surface tension can be altered by a variety of things, including surfactants found in cleaners/shampoos and also by dirt & contamination. It is not uncommon for the surface tension to change overtime as the vehicle becomes contaminated or if heavy cleaners are used. This may happen over the course of years, or it may happen more quickly depending on your particular situation. If you wish to restore water beading, a coating topper like CarPro Reload, GTechniq C2, Gyeon Cure, or 22ple VS1 will mimic the hydrophobic properties of a silica based nanocoating. Thanks for the explanation. I still have some Reload left that came with the ceramic coat kit. I will wash and spray that on. Happy to help. I recommend using Reload after washing every 1-2 months for best results. My car was detailed with a carnauba wax. 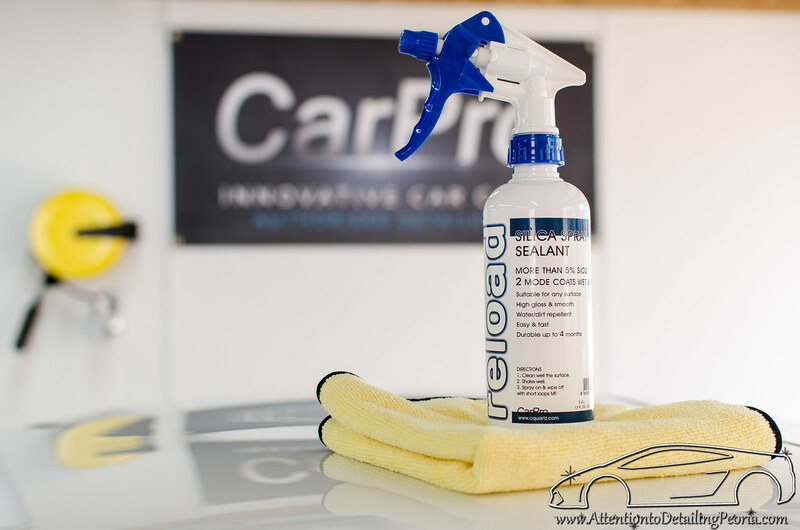 Can Reload be applied over carnauba wax to keep the car looking good in between details. I have used it Cquartz and it worked great but not sure if it can used over wax. Sure, you can apply reload on top of any clean vehicle regardless of what other type of protection may have been applied previously. In some cases Reload may perform differently depending on what else is on the vehicle. After reading your review of Optimum Gloss Coat I bit the bullet and applied it to my new BMW. Very happy with the result so far. I’m finding a light coat of Opti-Seal after washing and drying makes the surface ‘pop’ again and will hopefully give some protection to the gloss coat long term. Obviously the opti-seal won’t last long on the surfaces but if it lasts long enough between washes it’s doing its job.